The new whitepaper ”Google Analytics, ML and AI” from eCapacity shows you how to make your web analytics-data suited for predictive ML-analytics using Google Custom dimensions, tag management and Python scripts. The best analyzes of what really matters for what users end up buying, clicking or reading when they visit your site are often based on data. If you ask a Random Forrest or a simlilar ML-algorithm to look through the many traces a user leaves behind when he og she clicks through your website, new patterns typically arises – often enabling you to optimize your offerings. 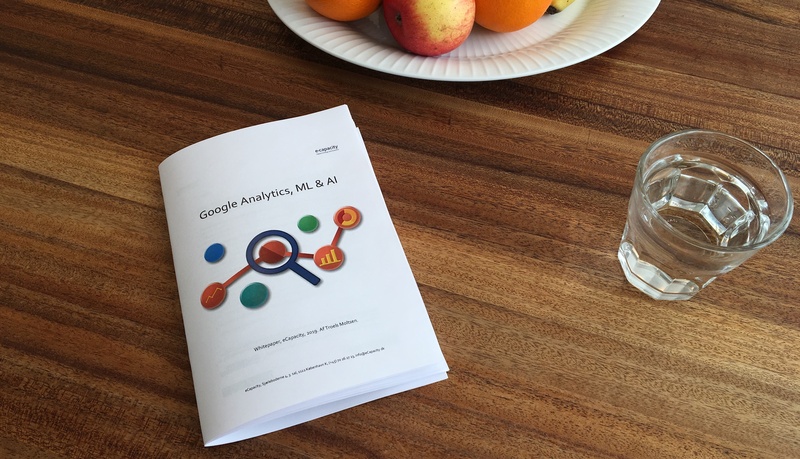 The white paper “Google analytics, ML and AI” reviews how to extract ML analytic data from Google Analytics. You can download the whitepaper for free right here. However, before you get there, the algorithms must be able to read your data. And here Google Analytics proces challenging to work with. If you pull data out through the standard GA API, data is typically delivered in a big bulb story lacking eg the user ID necessary to bind the stream of data together. Also, GA samples the data instead of giving you a full data-extract. However, help is available. The trick handle how Google outputs it’s data is to first create two new Customs Dimensions, customize your Google Tag manager and then run a handful of Python Scripts. How this is done is what in the new white paper “Google Analytics, ML & AI” describes in a hands-on approach. The whitepaper consists of four chapters, all of which have previously been published as separate blog posts. Now they’re assempled in a single PDF document giving you the full overview. It’s 29 pages long, completely free and is available for download right here. The white paper "Google analytics, ML and AI" reviews how to extract ML analytic data from Google Analytics. PDF, 28 pages, free.